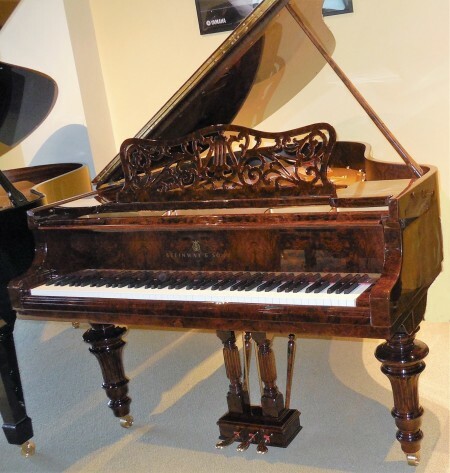 This 1920 Steinway Model O grand piano is 5’10” in length, showcasing a beautiful Burl Walnut Art Case featuring the classic Hamburg Steinway & Sons design. This piano is a beauty to play and see. This European piano restoration was done in Europe by a handful of skilled piano artisans providing the the most authentic style of rebuilding of Steinway Pianos. Unlike the typical American restoration, this piano still uses it’s original soundboard, case and action. Although all parts simply do not perform forever, only the parts that were compromised have been replaced, using parts only from the same manufacture (Steinway and Renner) as when the piano was originally made in Europe.